Ben Simmons joins "The Late Late Show with James Cordon" on Tuesday, August 14, 2018. 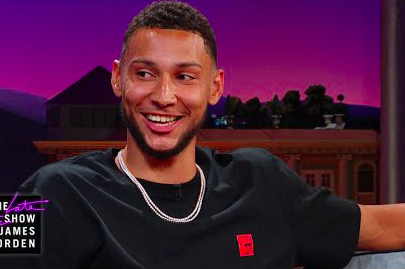 Philadelphia 76ers star Ben Simmons was born ready to play basketball, boasting Tuesday on "The Late Late Show with James Cordon" that he used to spit his pacifier into the kitchen sink as if it were a hoop. Simmons' father, a pro basketball player in Australia, clearly raised his youngest son to play the game he loved from a very young age. On Tuesday night's show, Cordon shared footage of Simmons darting through his dad's legs at four years old and dunking into a baby net. "When I was 16 years old, I came back from America and played (my dad) one-on-one," Simmons said. "And he kind of realized, 'he's getting older. It's time to hang them up.'" The NBA Rookie of the Year, joined by actress Mayim Bialik, shared several interesting anecdotes from his childhood and a hot sauce trick he played on his older brother after coming to Philadelphia. After the interview, Simmons and Bialik teamed up against Cordon and his producer in a game of "Nuzzle Whaaa?" which involves wearing a blindfold and rubbing your nose against random objects to guess what they are, no matter how disgusting. Let's just say the odd hobby of Simmons' teammate Robert Covington probably helped him out here.